Want to jazz up a hunk of brie? …add some sophistication to a toasted cheese sandwich? … or give a gift that doesn’t cost the earth? Go ahead and make a batch of red onion marmalade with this recipe and you can’t go wrong. The combination of beautiful spanish onions with red wine, port, and soft brown sugar gives this marmalade sweetness, depth, and a flavour that gets better and more intense the longer it lasts – and it won’t last long! I bought my onions and garlic from the beautiful St Albans Market – it’s much cheaper than buying from the big supermarkets, and you can be sure that the produce is fresh. 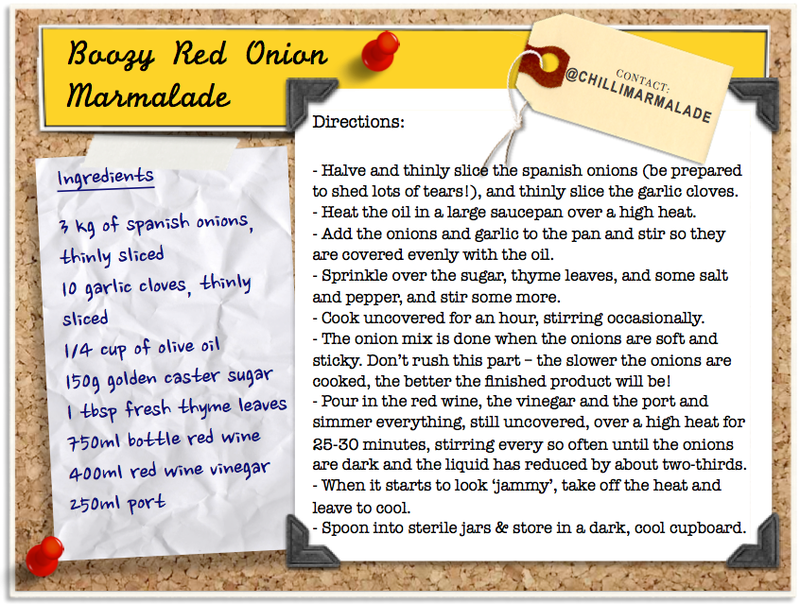 This amount of ingredients makes about a dozen small jars of red onion marmalade – probably eight larger jars. I love the process of making this marmalade. The chopping and slicing and stirring and jarring can be quite meditative, and it’s one of my favourite ways to spend a rainy Sunday. 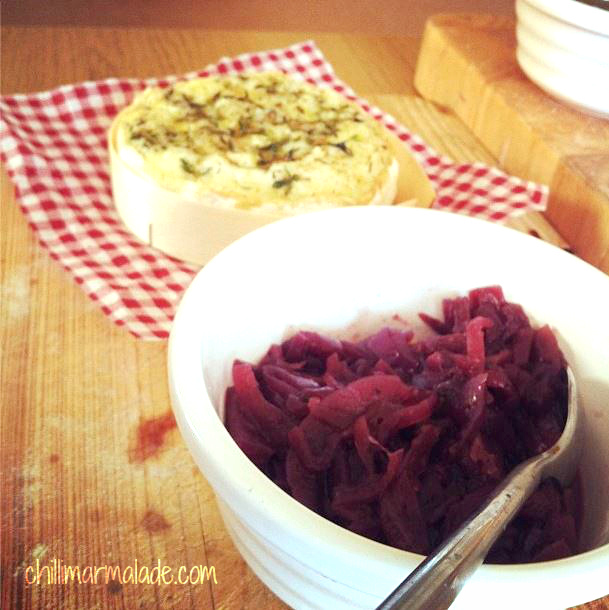 This boozy red onion marmalade is so good when paired with my baked petit camembert recipe, a dish of pickles, and crusty bread for a perfect lazy dinner. At Christmas, I like to give my ‘marmalade combo’ as a gift, which is a jar each of this red onion marmalade, together with my chilli marmalade. Both look pretty when all packaged up, and are delicious with leftover turkey and anything else that can be scavenged from the fridge on Boxing Day. 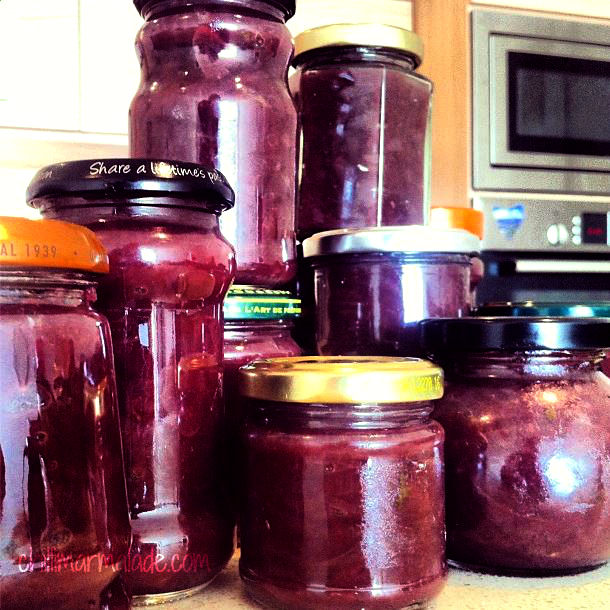 Tags: Christmas, cooking, food, gift ideas, jam, recipe, recipes, red onion marmalade, red wine, wine port. Bookmark the permalink. This marmalade sounds delicious. I love the idea of it on a toasted cheese sandwich or panini. I am looking forward to reading more of your recipes and browsing through your wonderful blog. That sounds amazing. 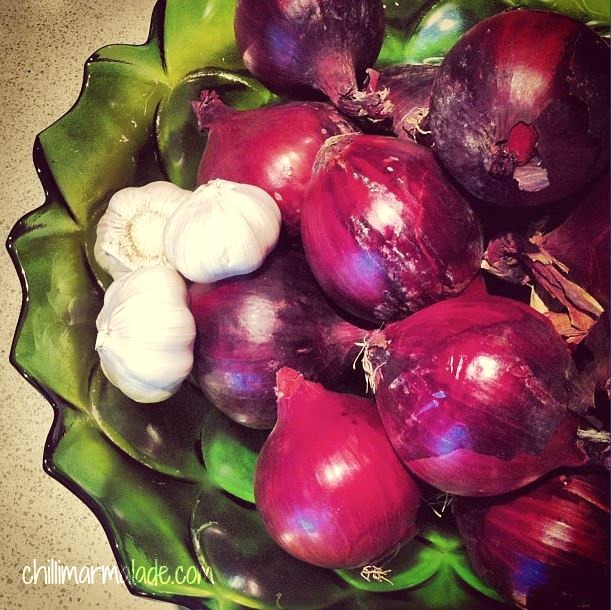 I’ve been meaning to make a red onion marmalade since Christmas. And, as red onions are on special offer this week I’m hoping to do mine, without the booze. Don’t know if it’ll work but it’s worth trying. Onions… port… brie! Amazing combination! Thanks for sharing. Love the color of the marmalade. Good timing…I’m just ready to start my first canning project!!! Your recipes look wonderful! Thanks for stopping by my blog, I look forward to following your posts! Lovely condiment– but I would definite use the food processor to slice that many onions. Looks great, also saw it on cathyandchucky. Is the golden caster suger any different to caster sugar? ?